Dragon Nest is a free-to-play fantasy MMORPG developed by Eyedentity. It uses a non-targeting combat system ensuring that players have complete control over every single one of their character's movements. Dragon Nest requires users to advance their characters by teaming up and traveling into instanced dungeons. 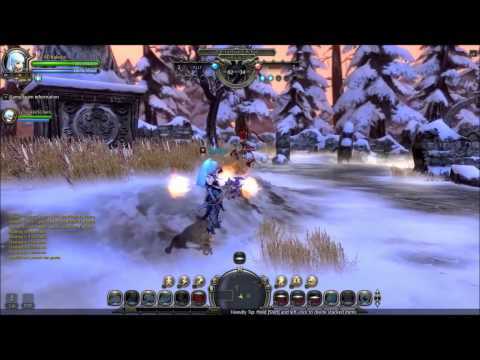 Dragon Nest incorporates non-targeting system gameplay to create a fast paced action filled experience. Players choose from a range of hero classes, characters that are of the Dragon Nest storyline that can equip customizable gear and weapons. Characters exist in worlds. These characters cannot interact with one another, including the exception of mailing each other. Devastating skills can also be learned, to increase one's power when defeating monsters in instanced dungeons or defeating other players in PVP. Dragon Nest also has the advantage of being nearly completely skill based, with lower level characters being able to defeat high level characters in PVP with skill alone. This allows a more experienced player that is of a lower level to dominate a less experienced player of a higher level player in PVP. This is a Dragon Nest video made by my daughter. In this video she plays Kali in 2 vs 2 matches with her two cousins. I also play a Sorceress. Video was captured in High Def.